I loved the first six issues of the current "Moon Knight" series. Between Warren Ellis' writing, the art of Declan Shalvey, and amazing color-work by Jordi Bellaire, it was an utter treat from the first issue until the end of the all-too-brief run. It was a perfect trifecta of talent and once I heard it would basically end with the sixth issue all I could do was mope some and have high hopes for the next creative team to do a good job too. Thankfully, the comic has maintained its quality, if a decent seventh issue and amazing eighth issue are any indicator. When I heard that Brian Wood would be replacing Ellis as the writer I felt some trepidation, as even though Wood has turned in some great work on various comics almost no one else writes in the odd way Ellis does--plus all the sexual harassment matters that came out last year involving him has left a sour taste in my mouth. I then also heard that Shalvey would be replaced by Greg Smallwood on art, and as I'm not too familiar with Smallwood I thought I would wait to pass judgement on how the comic would look. I was at least relieved to hear Bellaire would be staying on the book, ensuring we would continue to get the amazing colors with the cool effect of Moon Knight being an eerie stark white against all the background elements. Now that I've had two issues to get a feel for this new set-up, with the latest issue coming out this week, I feel I can offer at least somewhat of an opinion on why this is still a super-solid series. I did not know the doctor would be as important in Wood's issues as she is in Ellis' first. 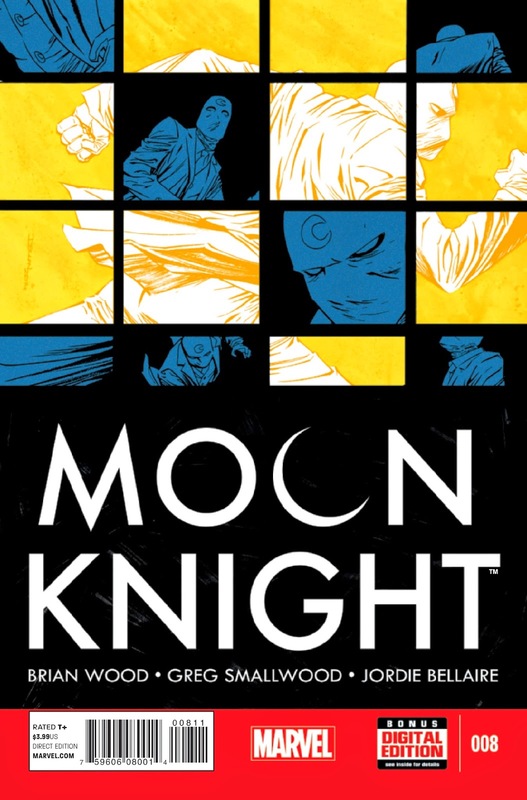 Whereas the first six issues of Moon Knight were all basically stand-alone tales with only the sixth bringing some aspects together, here Brian Wood seems to be trying to do a balancing act of having each issue sort-of stand alone, but also clearly connect to the other with plot elements that carry-over more-so than with Ellis' mini-run. 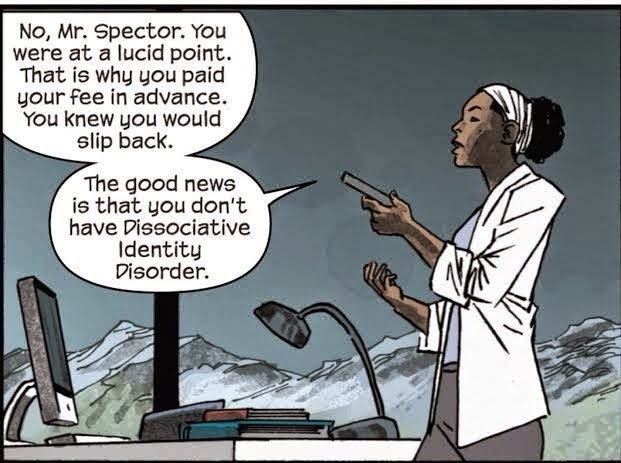 A doctor-character we've meet briefly before in the first issue of this series is scorned in issue seven and it comes back to bite Moon Knight on the proverbial bottom in the eighth issue. It is clear a kind of over-arching plot is forming, but like Ellis' run each issue could still be considered mostly a tasty single serving--unlike say, Bendis' run which was basically one sort-of decent story stretched out over 12 issues. With it established the issues stand pretty well on their own even with Ellis' departure and Wood's arrival, the question becomes if the comic itself is still good, with this new writer and artist. Well, the seventh issue(Wood and Smallwood's first) is decent if not amazing. It is a story with Moon Knight, but it sort of feels like almost any other heroic character could have been substituted for him and it would not have changed much within the comic. It basically is just about our hero stopping an assassin from killing a dictator who now has been able to shroud himself in a veil of legitimacy by holding questionable elections within the country he rules with an iron fist. Why exactly Moon Knight is trying to stop this assassination isn't clear other than his stating it isn't how he wants justice done. It's all perfectly well-written, and Smallwood does a solid job, but it lacks the "Wow" factor of Ellis and Shalvey's stuff. Thankfully, the eighth issue is an amazing piece of work that is just mind-blowing. 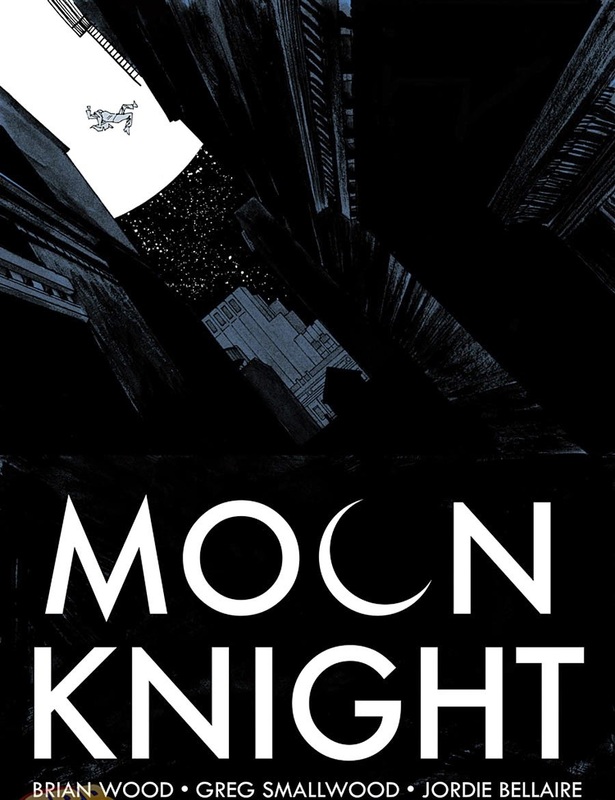 Issue eight of "Moon Knight" is incredible because just as Ellis and Shalvey seemed to have a symbiosis that resulted in some astonishing comics, in this issue Wood and and Smallwood turn in something just delightful. 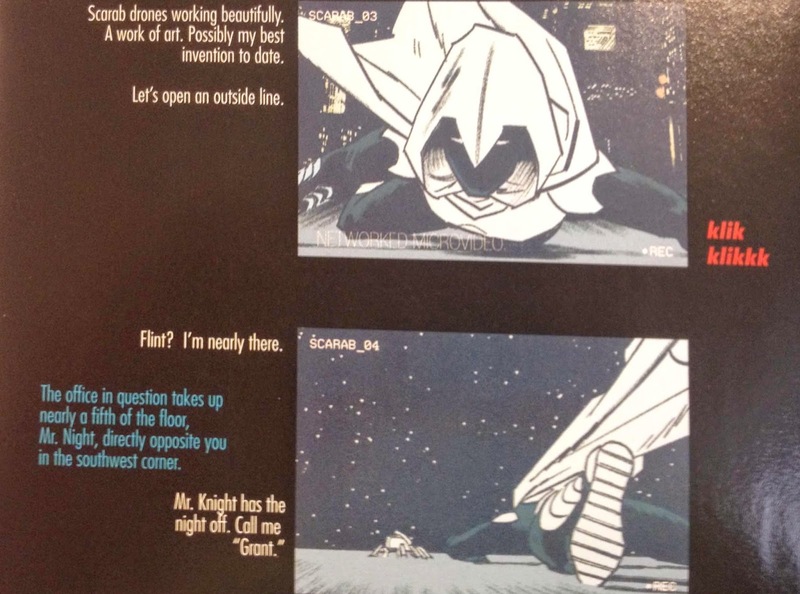 The majority of the issue is told as if being viewed through various forms of technology, be they the camera on a phone, a television broadcast, security camera, or Moon Knight's own personal drones. Also, this issue really feels like it is about Moon Knight, as it has discussion of his personality issues, his working with his friend on the police force (Flint), and otherwise maintains that off-kilter feel of wondering if our hero is really especially heroic. So yeah all the stuff that the best Moon Knight comics have always had. The situation itself is that the new World Trade tower has hostages taken within it and Moon Knight has been called in to resolve the situation--although clearly there is a bit more at play than meets the eye. The way Smallwood uses panel layouts to simulate various forms of how we would view an electronic broadcast is amazing and shows that this artist I only knew a little about is definitely quite talented. Coupled with Wood's writing style that makes Moon Knight seem just the right mixture of unbalanced-yet-professional it results in a stellar comic that makes my slightly lukewarm feelings about the seventh issue vanish away as I think about how superb this eighth one was. I enjoyed Moon Knight when done by Ellis and Shalvey the most when it used the form of comics in a creative way, with the whiting-out of panels over a series of pages in the 2nd issue being a prime example. Well, the eighth issue is so clever that it measures up to those first sixth issues with ease and even surpasses some of them in quality. A great deal of thanks also of course goes to Bellaire, who has maintained the murky-look of the series with that ever-impressive blinding-white of Moon Knight standing out in a way that is both imposing and confusing to the eye--but in a good way. The first six issues of Moon Knight were miraculous, with even the weakest issues being of great quality. While the seventh issue starts Wood and Smallwood's new run with a bit of a stumble, the eighth issue feels like a creative team firing on cylinders. The question now of course becomes if the ninth issue and on will be more like the decent-but-uninspiring seventh, or the dynamite eighth. Clearly I'm hoping for the latter, but only time will tell. Issues #1-#6 (overall): 4.5 out of 5--because there are some 4-star and 5-star issues, so it balances out. Issue #8: 5 out of 5 stars.